Severns Letting Agency is a privately run, independent residential property agent based in the Midlands, specialising in high quality rental properties and rental property management. Severns Rental Agency was originally established to let and manage large new build student developments in Nottingham city centre and continues to specialise in providing first class, affordable accommodation for both students and young professionals in Nottingham and the Midlands, ensuring a safe and secure environment in which to live. Their services include residential lettings, rental income collection, managing tenants and rental property maintenance. Our friendly and knowledgeable team are committed to offering the highest standard of personal service to both owners and tenants. Brand New for September 2019! Dating back to 1916, this iconic Grade II Listed building has a long association with Sheffield’s newspaper history as the former home of both the Sheffield Telegraph and the Sheffield Star newspapers for as long as anyone can remember. The printers have now stopping rolling but the Sheffield Star building lives on and is currently undergoing a multimillion pound conversion and refurbishment into 253 bed luxury purpose-built apartments and studios, perfect for students and young professionals, which will be ready for occupation in September 2019. Sheffield Star offers modern purpose-built accommodation designed to suit individual lifestyle preferences. A new spacious purpose-built reception area offers residents impressive contemporary communal areas, up to date gym facilities, on-site private cinema room and resident’s laundry room. 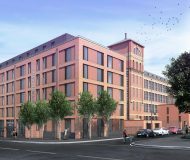 Brand new for 2019, Severns Rentals are delighted to present their latest residential scheme, Radford Mill, an iconic former mill building dating back to the turn of the century – which at one stage was used to assemble Spitfire engines during the second world war. This much loved, 5-storey former brick-built building has been sympathetically restored and retains many of its original characterful features with exposed internal brick work, full height industrial-style windows and high ceilings. Perfect for students and young professionals, Radford Mill offers 483 beds across a range of accommodation options to create an innovative urban residential village offering residents a choice of living options to suit individual lifestyle preferences.